Most, if not all, projects come with a strict and costly deadline. A date that is in place because the client, or your boss, needs the result by a certain date. These dates are on a lot of stress right from the start, due to the limits in resources, budget and time. When you create a project in Microsoft Project you naturally tend to look at that date as fixed. And therefore you would like to plan the project from that date backwards. 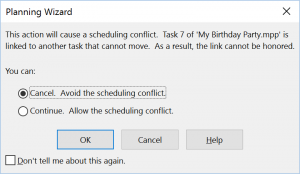 Creating a backwards schedule is possible in the application. 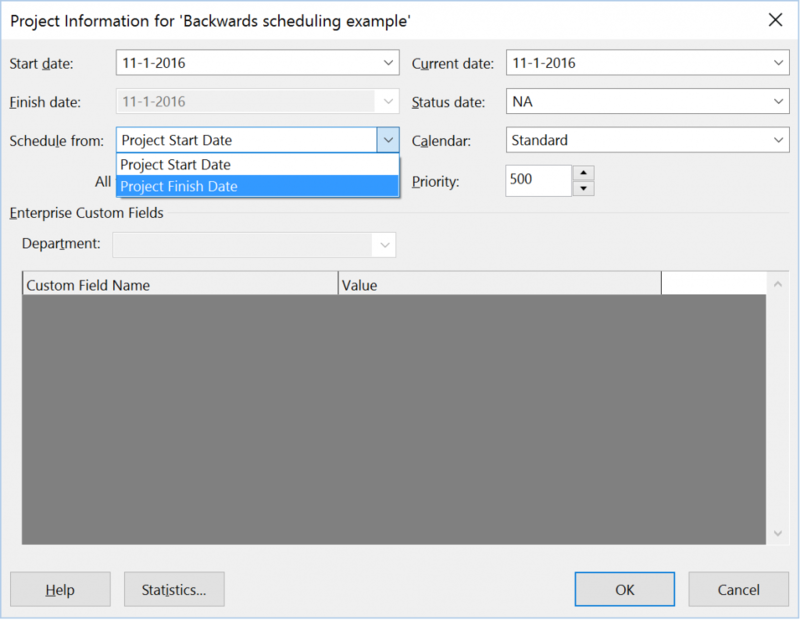 There is an option under “Project information” called Schedule from: Project Finish Date. Now here are two things that are of interest to note right from the start: every task starts on my birthday, and the milestone is at the end of the day! Milestones are usually at the end of a day, so this isn’t different from a normally scheduled project, however it still is something to keep in mind when you are on a strict schedule. 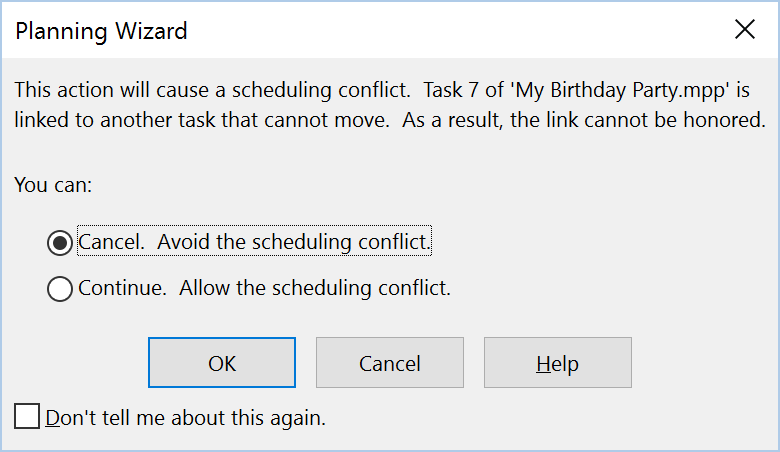 I used the normal way of linking tasks together, just select the predecessor, then the successor and use the link icon on the Tasks ribbon. This creates a link where the predecessor moves to an earlier date to be “finished” before the next task “starts”. From the screenshot above I can conclude that I would have to set up the invitations on the Friday before my B-day. That sounds wrong, so let’s put a lag between sending out the invites and the actual date. A month should do the trick. And I would do the same for ordering the Circus, but I’ll take 2 months for this. Here is what I wrote in the predecessors column on my Birthday task to get the result: 2FS+1mo;6FS+2mo. Now we are passed the current date (the red line in the schedule), damn I think we would need to skip the Circus. Or maybe find one that is a bit more expensive and limit the lag time on “6FS+2mo” to be just 1 month. Oké, now this we can explain because it will conflict with my B-day! I’m not going to move my party just because the Circus isn’t in town,,, come on that would be silly! So let’s hit cancel and just go with the predecessors change, that seemed to work. Ah good, I’m still on time! Alright, another exploration done! I’d like to finish with a conclusion on my statements about deadlines or using backwards scheduling. And I would like to share one of my favorite articles from way back. Also, this is the first big post on the new site, yet another reason for cake! I would still stick with scheduling from the start date of a schedule. It’s just to much thinking that needs to be done when you schedule the other way around. with locking tasks in predecessor columns instead of the tasks themselfs, start dates that don’t change when I change them… just to much hussle. In the early days as a consultant I only had a twitter account (@ErikvanHurck) and on that account I share useful posts I read from other bloggers. One of the most successful shared links was 8 Steps to Scheduling Success–Step 5: Enter Deadlines. It has a very nice explanation of deadlines. Although the pictures are outdated the information is still relevant. Hope you like the post, thanks Cindy for writing it. I created a scope creep view once, that would also help you with your scheduling from the start date. And if you want to know everything about start dates, go ahead and visit that post, or the video, on The (new) Project Corner Blog :). As always, thank you so much for reading the post. I hope you learned something about Microsoft Project, and it’s “inner workings”. Please leave a comment to let me know how you liked the post or want to know more. Hmm I do not think you attacked this in the correct way, at least not in the way that I have in mind. I am not familiar with MS Project or scheduling for the most part. We have a build project. I know when the project has to ship. I know approximately how long it takes to physically build the machine. I know about how long it takes material to get here after ordering it. I want to know when is the latest date that I can order that and receive materials on time for build. I do not want to have to compare with a red line and then play with dates and durations to push stuff around. I simply want the software to tell me the finish date of when I need to release the material. So, as someone who does not know the true meaning of all the settings, it makes sense to me to set the release date as a predecessor to the build date with a constraint that is “finish no later than” 6 weeks before the build date. Does that make sense? Thanks for responding (and sorry for this late reply). In a perfect world you would be right in wanting to know the latest date where you could order, but I believe there is a big risk due to “things not going as planned”. In a completely time locked schedule I would argue for a situation that you like to have a end date locked and work back from that, but even then (as I stated in the article) there is the struggle with chronological thinking. It’s just harder to do than setting deadlines and work from the “now” towards the “future”. The article is of course just an opinion, and you are free to give it a try in MS Project. I would love to hear your story once the project is done. How did you plan it, how did it work out for you… Any way, thank you for the comment and thank you for reading. Previous Previous post: Happy Easter and welcome to the new Project Corner Blog!